Sir Michael Leigh is a former Commission official and senior fellow at the German Marshall Fund. A reaffirmation of interest in the Western Balkans, a politically fragile area surrounded by EU member states, is timely. But EU leaders in Brussels should not get too far ahead of member states or raise hopes that are unlikely to be fulfilled. President of the European Commission Jean-Claude Juncker provoked perplexity by his prediction that the EU could have more members after 2019 and his call for a special strategy to prepare Serbia and Montenegro for membership by 2025. Why did he make these remarks, given democratic weaknesses in the region and the member states’ reluctance to consider further expansion? 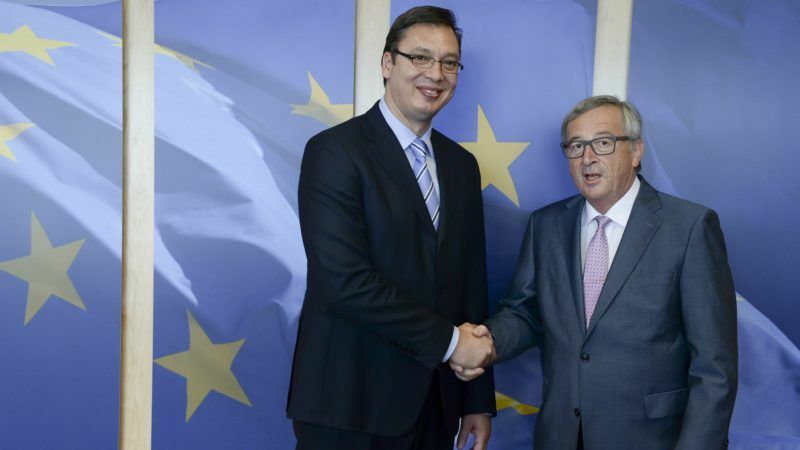 Junker has a good relationship with the region’s de facto leader, Aleksandar Vučić, president of Serbia and a fellow member of the European People’s Party (EPP). The EPP’s success in the 2014 European Parliament election catapulted Juncker into his present position. Perhaps the Commission President is also making amends for his earlier comment that no candidate country could expect membership on his watch. But Junker, a proponent of the EU’s embryonic “security union,” should not rely on future membership as the remedy for regional instability. Moreover, common membership of the loose EPP group is not a sound basis for policymaking. Picking out Serbia and Montenegro for a dedicated membership plan with an implied accession date is scarcely justified by facts on the ground. To be sure, Belgrade has retained much of the administrative capacity of the former Yugoslavia and Montenegro, a country of just over 600,000 people, joined NATO in June. For now, these are the only countries actively involved in EU membership talks. But their relations with neighbouring countries as well as their own democratic reforms have a long way to go. The Commission’s progress reports show that much remains to be done to overcome reform fatigue. EU leaders appreciated the closing of the Balkan migration route, following the 2015 refugee crisis. The growing influence of Russia, as well as Turkey, China, and the Gulf States in the Western Balkans may also have led Juncker to reiterate the region’s European destiny. Juncker clearly wanted to make a sharp distinction between Turkey, whose aspirations for EU membership are off track, and the Balkan countries, which are moving ahead, albeit falteringly. Still, the alleged coup attempt in Montenegro, and the storming of the Macedonian Parliament this spring were reminders that stability in the region cannot be taken for granted. Many young people from Kosovo and Bosnia-Herzegovina have joined the self-proclaimed Islamic State and arms trafficking is widespread. There are limits to outsiders’ capacity to impose effective democratic reforms without the wholehearted commitment of the governments concerned. Even the incentive of membership is not always decisive, as backsliding in Central and Eastern Europe shows. The EU is considering withholding financial support from member countries that do not live up to the bloc’s democratic standards. Fresh thinking is needed if the EU wants a credible enlargement strategy in the Western Balkans. People there are tired of hearing about EU membership while little changes in their daily lives. The 2017 Balkan opinion barometer, produced by the Regional Cooperation Council, shows a severe drop of trust in an EU future (the most enthusiastic are the Kosovars though their membership prospects are probably the most distant of all). In Serbia, only 26% of respondents consider that EU membership would be a good thing for their country. Anxieties over corruption, crime, and the “brain-drain” are on the rise. To build trust, the EU needs to come up with real and tangible incentives, beyond visa liberalisation. A renewed effort is required to promote reconciliation after the conflicts — the scars remain all too visible. The EU should focus more on support for civil society, especially through small-scale projects in rural areas that can be implemented quickly. GMF’s Balkan Trust for Democracy is a model for turning around project applications quickly and keeping bureaucracy to a minimum. Ultimately, it is civil society in the region rather than the EU that will hold governments accountable. Taking on new members is hardly the flavour of the month in an EU beset with challenges from eurozone governance and unemployment to migration, terrorism, populism, erosion of support for mainstream parties, and Brexit. The Western Balkans’ will lose one of its main proponents once the UK leaves the EU. Germany, the region’s other major advocate, faces a period of political turbulence. President Donald Trump favours a low profile for the United States in world affairs. The US administration seems content for the EU to lead in the region, while continuing to provide support below the political radar screen. The governments of the Czech Republic, Hungary, Poland, and Slovakia are wary of current speculation about a “multi-speed’ Europe, fearing that they could become second-class members under such a scheme. Any hint of an alternative to full membership would be discouraging in the Western Balkans. Yet, a more flexible EU, possibly involving different forms of provisional membership, may be required in the future to maintain the credibility of the enlargement process.